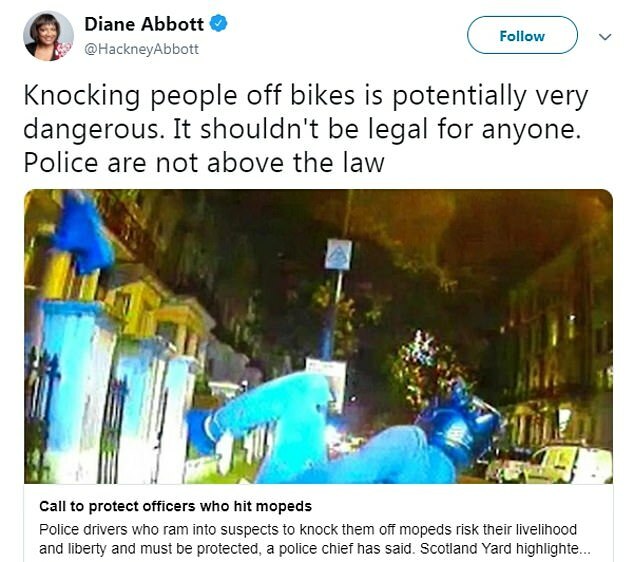 Police have hit back at Labour's Diane Abbott after she criticised the Met for knocking moped yobs off their bikes. Scotland Yard was praised by Londoners last week after it released footage of its new 'tactical contact' method of catching scooter criminals. Detectives explained they only use the technique - which involves tipping thieves onto the ground by driving into their bikes - when the riders become a danger to the public. But Shadow Home Secretary Ms Abbott, who will be in charge of policing if Labour win the next election, was unimpressed by the footage. 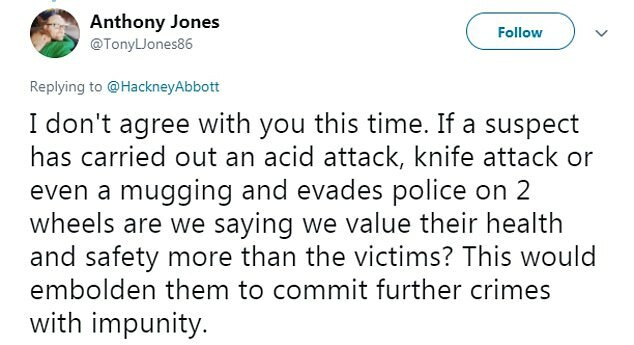 The Labour frontbencher, who is MP for Hackney, a borough plagued by moped crime, waded into the debate four days after the police announcement. Stats released earlier this year show her constituency has seen more than 3,000 moped-enabled crimes in the last five years. But her comments aroused an angry response from both the public and police, who insisted her interpretation of the law was incorrect. Londoners also defended the police's new methods and accused Ms Abbott of being 'on the side of criminals'. The Met revealed on Friday that specially-trained drivers are tipping criminals on to the ground or on to the bonnets of their cars to get them off the streets. Scotland Yard said the tough new tactics cut crimes linked to two-wheeled machines by a third, from 19,000 offences to 12,500. 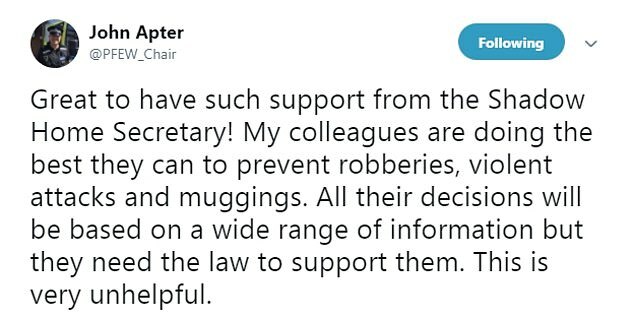 They are being rolled out across the country to stop mopeds being the transport of choice for reckless career criminals with no regard of the law. Commander Amanda Pearson said: 'Offenders on mopeds and motorcycles who attempt to evade the police are making a choice that puts themselves and others at risk. The new tactics have however led to police groups calling for protection for officers who use 'tactical contact' in high speed chases.